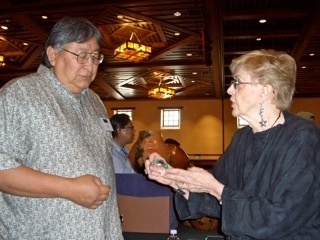 No other American Indian jeweler today has a more distinctive style than Mike Bird-Romero of San Juan and Taos Pueblo descent. His broad, silver cuff bracelets accented with single large stones make quite a dramatic fashion statement although any of his jewelry is exciting. I’ve represented Mike Bird-Romero for more than 20 years, and in that time, I’ve seen him slowly move away from a distinctly contemporary jewelry look to one that is more reminiscent of traditional Southwestern American Indian jewelry. A particular feature of Mike Bird-Romero’s work today is the frequent incorporation of miniature carved animal figures into his silver bracelets. He calls this technique his “sculpture within jewelry” concept. Look, for example, at the way he sets a small Acoma jet frog surrounded by a mosaic of turquoise into a silver bracelet, or the way he has created a fish pin by setting a carved fish profile made of fossilized bone surrounded by small bits of abalone depicting water. These pieces of jewelry are examples of American Indian artwork at its finest! I recently caught up with Mike at the Native Treasures Indian Art Festival in Santa Fe, where an array of artists exhibited their work to benefit the Museum of Indian Arts and Culture. 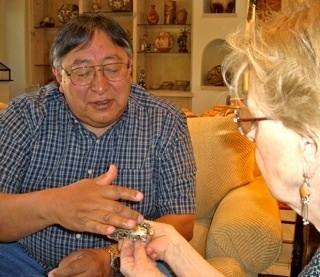 Appropriately, in 2007, Mike Bird-Romero received the Museum of Indian Arts and Culture’s prestigious Living Treasure Award. Seeing Mike at Native Treasures reminded me just why he was deemed a “Living Treasure” by M.I.A.C., for I was again struck by the dramatic quality of his jewelry. With his permission, I enthusiastically present Mike Bird-Romero as this month’s Featured Artist.